Chef Bill believes two things must be in place to be a great cook: an absolute love for eating, to the point when you finish one meal you’re already thinking about the next. Second, be completely taken by the act and art of feeding others, especially when serving total strangers. His experience in the catering services is broad-ranging and diverse: from fundraising events (ex., Hillary Rodham Clinton) to luxury car dealer and corporate events (i.e., Mercedes, BMW) celebration events to celebrity VIP parties (ex., TNT’s Kenny Smith) to hospital and private medical practice luncheons. He’s also catered weddings both outdoor and indoor, as well as residence dinner parties and other personal events. 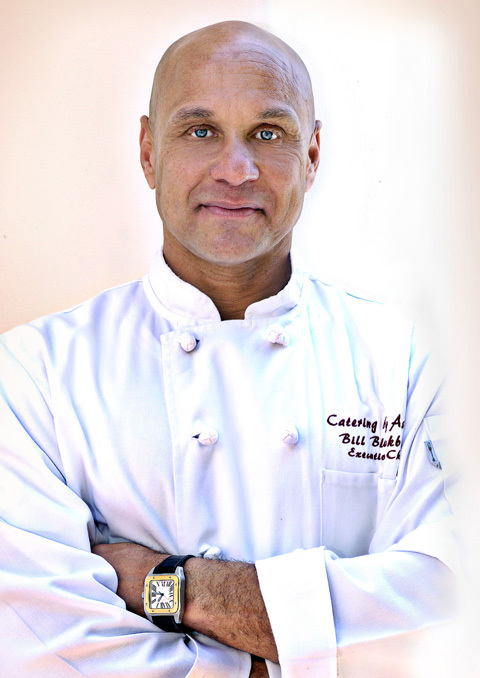 Drawing on veteran military and corporate experiences, Chef Bill brings to his catering high ethical standards, unparalleled professionalism, succinct organization and precision, unwavering customer service, strategic outside-the-box thinking, command leadership and an ability to produce in pressure situations. After graduation Chef Bill took advantage of his successful background in corporate sales, marketing, and business development to launch Blackburn’s Catering – a full service catering service. Over the years, he has acquired a studied appreciation of the many aspects of catering, including menu development with an emphasis on custom tailored menus, creativity, staffing, purchasing, selecting the best food vendors, event planning and most importantly – managing the timeline. For Chef Bill, when clients finish a plate and smile, or even just talk about the food, he experiences immeasurable joy and satisfaction. As a young man, this Pasadena native discovered his love of working in kitchens while watching his Grandpa Harris work magic on the grill and while assisting his Dad at catered events. After graduating from the Le Cordon Bleu School of Culinary Arts in Pasadena, his first stop was the Excalibur Hotel in Las Vegas where he developed a passion for cooking various cuisines from around the world. From there he moved to the newly built Venetian Hotel where he learned the art of fine dining and presentation. It was at the Venetian that he developed his palate and learned refined French techniques, providing him with a foundation for his current position at Blackburn’s Catering. 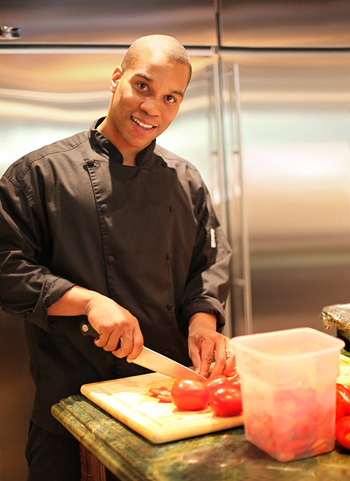 Justin Blackburn brings a welcomed young, creative energy to Blackburn’s Catering. His love for experimental cuisine and his thoughtful, artistic point of view adds depth and a modern edge to every dish he prepares.